Is this a question which you have asked yourself or heard friends asking each other? 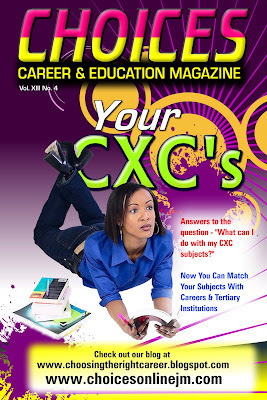 Well, our CHOICES Career & Education Magazine issue themed "Your CXC's" will help you to answer that question. This issue gives you a run-down of all CXC's CSEC and CAPE subjects and will also help you to match your subjects with careers and tertiary institutions. Get your copies from Sansgter's Book Stores or from CHOICES at 876-969-5741.